fib Bulletin 81 reports the latest information available to researchers and practitioners on the analysis, design and experimental evidence of punching shear of structural concrete slabs. 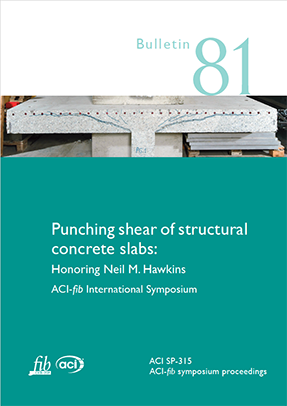 It follows previous efforts by the International Federation for Structural Concrete (fib) and its predecessor the Euro-International Committee for Concrete (CEB), through CEB Bulletin 168, Punching Shear in Reinforced Concrete (1985) and fibBulletin 12, Punching of structural concrete slabs (2001), and an international symposium sponsored by the punching shear subcommittee of ACI Committee 445 (Shear and Torsion) and held in Kansas City, Mo., USA, in 2005. This bulletin contains 18 papers that were presented in three sessions as part of an international symposium held in Philadelphia, Pa., USA, on October 25, 2016. The symposium was co-organized by the punching shear sub-committee of ACI 445 and by fib Working Party 2.2.3 (Punching and Shear in Slabs) with the objectives of not only disseminating information on this important design subject but also promoting harmonization among the various design theories and treatment of key aspects of punching shear design. The papers are organized in the same order they were presented in the symposium. The symposium honored Professor Emeritus Neil M. Hawkins (University of Illinois at Urbana-Champaign, USA), whose contributions through the years in the field of punching shear of structural concrete slabs have been paramount. The papers cover key aspects related to punching shear of structural concrete slabs under different loading conditions, the study of size effect on punching capacity of slabs, the effect of slab reinforcement ratio on the response and failure mode of slabs, without and with shear reinforcement, and its implications for the design and formulation in codes of practice, an examination of different analytical tools to predict the punching shear response of slabs, the study of the post-punching response of concrete slabs, the evaluation of design provisions in modern codes based on recent experimental evidence and new punching shear theories, and an overview of the combined efforts undertaken jointly by ACI 445 and fib WP 2.2.3 to generate test result databanks for the evaluation and calibration of punching shear design recommendations in North American and international codes of practice.